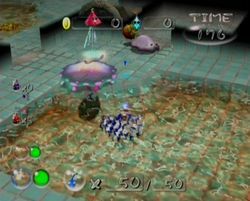 The Giant's Bath is the twentieth level within Challenge Mode in Pikmin 2. You are exclusively given Blue Pikmin. It has many enemies and features the rare Toady Bloyster. You should watch your Pikmin as you collect treasures. As you start, go for the Toady Bloyster. Don't go in the water, as you'll waste more time. Before leaving, avoid the Bumbling Snitchbugs, since they are able to grab you. Afterwards, go deeper into the cave. Remember: if you want a pink flower, you don't have to collect any treasure other than The Key dropped by the Toady Bloyster. ↑ The number of Ivory Candypop Buds appearing here is either 1 or 2 (random). The Ranging Bloyster awaits in the arena. To battle it effectively, split your leaders and ambush it. When moving, be fast and continue switching or it'll start to eat your Pikmin squad. Run until you are under its bulb-like gill and use the same strategy as you did for the Toady Bloyster. Get the key and leave the challenge level. This page was last edited on March 17, 2017, at 20:29.